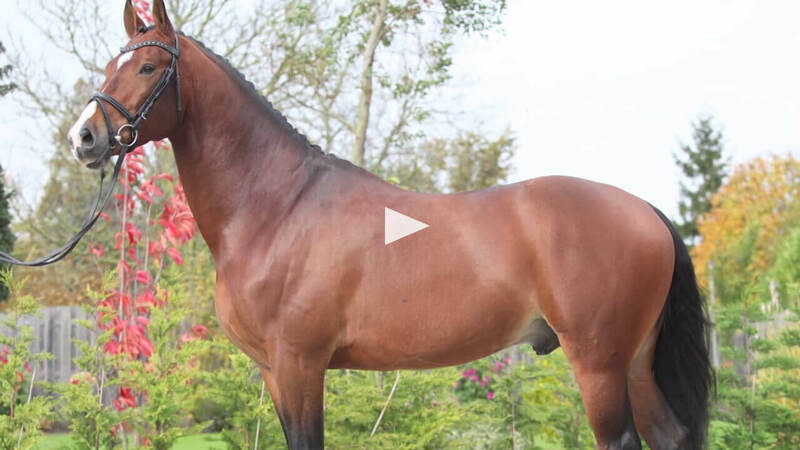 Ever done a double take when you’ve seen an especially handsome horse? A dazzling coat and a glossy, flowing mane and tail will always turn heads, whether you’re in the show ring or heading down the trail. You may never plan on showing your horse, but you still want him to look his best. Your obvious starting point is providing complete, balanced nutrition designed for your horse’s age and use. Then comes the fun part: a regular grooming routine that keeps his skin, coat, mane and tail clean and conditioned. Beyond appearances, grooming is a time of bonding and relaxation for you and your horse. It’s also a great way to spend quality time with a horse you can’t ride for whatever reason, such as a young horse, an old retiree or a horse recovering from injury. To find out what kind of grooming routine the pros rely on, we chatted with Tina Anderson of Millsap, Texas, a lifelong horse owner and an American Quarter Horse Association (AQHA) judge for 15 years. 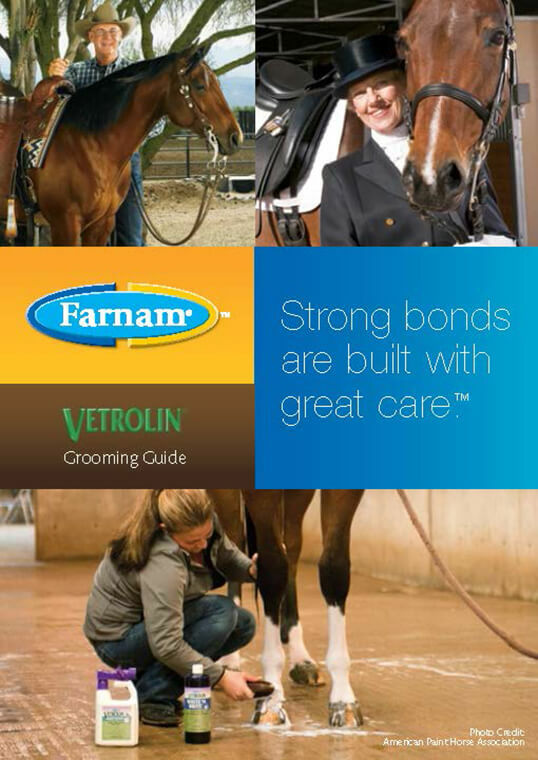 Anderson is also Director of New Product Strategy and Development at Farnam Companies, Inc.
Anderson has used the following routine for decades and finds it works well for any type of horse. Start with the head. If you have a small rubber currycomb, use this very gently on the face. Otherwise, use a soft brush and a soft, damp towel. Wipe out ears and nostrils carefully with the towel. Spray a detangler/shine product on the mane and tail; let it absorb a few minutes while you curry and brush the rest of the horse. Use a rubber currycomb over the entire body, including the belly and flanks. Brush off the dirt you’ve raised with the currycomb using a stiff-bristled brush. Be gentle on the legs. Follow by running a soft-bristled brush over the whole body. For mares, use your towel to clean the udder gently, including between the teats. For males, check and clean the sheath weekly, or, at the very least, monthly. Pick out the hooves with a hoof pick. Use a hoof pick with bristles on one end (or a stiff brush) to remove any dried mud or manure from the outside of the hoof. Use your fingers to pick through the tail to remove any tangles, starting from the bottom and working your way up. If it’s tangle free, you can use a soft brush. Never use a comb in a tail; it pulls out too much hair. Use a mane comb to comb out the mane. If the mane is long or thick, treat it as you would a tail, skipping the comb and using your fingers or a soft brush instead. Beyond appearances, grooming is a time of bonding and relaxation for you and your horse. Finish up by running a clean grooming towel over your entire horse to remove any last traces of loose hair, dust and dander. You won’t need to use a detangler/shine product every day, but spray it on every few days or as needed to keep your horse’s mane and tail from tangling. This will also help repel dirt and stains, keeping his body clean and his coat conditioned. Don’t forget to clean your brushes every few days, or even daily if your horse is especially dirty. Just swish them in a bucket of soapy water, rinse well with clean water and let them dry in the sun. Unless the weather is too cold, you’ll want to rinse your horse off after every workout to remove dirt and sweat. It might smell wonderful, but shampoo isn’t needed every day. Once a week is plenty. And when you do shampoo, be sure to choose one that’s formulated for horses and follow label directions. Don’t forget the mane and tail, but be sure to rinse out the shampoo completely or it can leave a gray, gummy residue. Anderson has found that the best method is to use a bucket when washing tails. Carefully submerge the tail in a bucket of soapy water and scrub well with your fingers, making sure to go all the way up to the top of the tail and under the tailbone. Rinse thoroughly, and to make sure you’ve removed all the soap, refill the bucket with clean water and submerge the tail completely. A frequent complaint about human hair products is that buildup can occur with continued usage. Anderson says this isn’t typically a problem with horse hair products … providing you’re using the right products correctly. When the weather’s too cold for bathing, use a dry shampoo made for horses. You spray it on, massage it in and wipe it off with a damp towel. This is especially effective on manure and urine stains. Not grooming regularly. If you’re not in a regular grooming routine, you run the risk of missing small problems that can become big issues. Plus, your horse simply won’t look his best. Using the wrong grooming tools. Use brushes and tools made specifically for horses. That means no metal currycomb or scraper; they can be hard on skin and damaging to hair. Combing tails. A comb and a tail should never meet! Combs pull out hair, even when used carefully. Use your fingers and a detangler product. Start from the bottom and work up to remove any knots. Only when a tail is tangle free should you use a brush on it, but skip the comb. Shampooing too often. Shampoo can dry out the skin and hair coat when used too frequently. Once a week is plenty and many horses don’t even need it that often. Applying shampoo directly to the horse. Read the label! Many equine shampoos are concentrated and require only a small amount in a bucket of water. Pouring it on the horse wastes money and the product won’t work as intended.